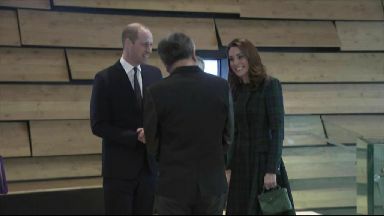 The Duke and Duchess of Cambridge have told Michelin employees they deserve "enormous credit" during their visit to Dundee. William and the Duchess of Cambridge met with staff from the closure-hit tyre plant in the city on Tuesday. Speaking at a Michelin Action Group meeting, William said: "The factory has been a huge part of Dundee's very fabric. "It has been a key employer for generations and has helped sustain the local economy for nearly 50 years. "For everyone affected, the hope is that all of you sat in this room can find a positive way forward. "You all deserve enormous credit for sitting around this table together to find a constructive way forward. It is understandable that there are different views about what is the right course to take. "As I have just heard, when a community faces uncertainty, people feel more optimistic when leaders such as yourselves work together for that community. "Because of the collaborative approach adopted by the people in this room, I am optimistic that a good outcome is possible with the site at Michelin." He added: "I am encouraged by the fact that this taskforce has been established and that all the key players are represented. "As a result of you working together responsibly to find a long-term solution, you have already reached agreement on developing the site into a manufacturing, recycling and low-carbon transport hub. "The workers we spoke to just now were encouraged to hear about this. "They look forward to hearing further detail about how this will affect them directly. Catherine and I look forward to learning more about your plans in this discussion. "Both of us, and all of the people that we have spoken to today, are willing you to succeed." 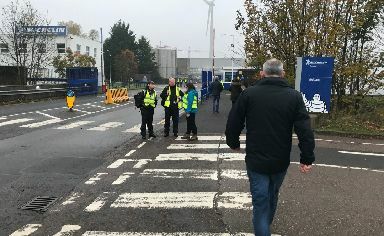 The French firm - which employs more than 800 people at the site - announced the closure in November, which will be done by mid-2020 after it was deemed "unsuitable" in the current climate. Since then it has joined the taskforce - along with the local authority and Scottish Enterprise, among others - to find a solution for the site and its staff. Brian Cairns is the firm's HR business partner, working on the My Future programme to help reskill and retrain staff. The 54-year-old from Alva, Clackmannanshire, said: "(The Duke) was interested in who we are and the service with Michelin. "He was also interested in how we were feeling about the redundancy announcement. "One of the comments he made is how there seemed to be a lot of camaraderie still at the table. "The problem we have in Dundee is we have people who have been employed for 30, 40 years and have never written a CV, have never had an interview and the job market has changed dramatically. "What Dundee are offering its employees I've never heard of before. It's absolutely fantastic." The 27-year-old senior industrial engineer said: "The news was disappointing for us all, but he was just wanting to see how everyone was doing. "Everyone was quite positive and optimistic. As you can imagine, the news we got wasn't great, however with every door that shuts there's another one that opens. "We're starting to see there's light at the end of the tunnel and there's going to be opportunities for us all to find something. "He made light of the fact that he was surprised that we were all so positive. "It's impressive what the company is doing, the support that's there was quite surprising for him - he was used to something different that he's seen in other places. "As much as I'm saying the company's supporting us, that wouldn't be if it wasn't for the workers getting back after we found out the news and in a couple of days back to the hard work and making tyres again. "It's good that he's optimistic, but none of us are going to get carried away." He added that the royal couple showing their support sent a "really powerful message" to large-scale employers who close such sites. Linda Sandilands is PA to the factory manager and joined the duchess at a table. The 55-year-old of Dundee said: "Everyone was devastated (when the closure was announced), but we're turning it into a positive. "Everybody's rallying around each other, it's becoming more of a big family. "I think it was very good (the royal couple visited us), it's quite a positive thing for the factory. "It makes people think that they're thinking of everybody and they're realising what's happening to the factory." Scottish economy secretary Derek Mackay added: "I want to thank the Duke and Duchess of Cambridge for attending the Michelin Dundee Action Group and for recognising the collaborative approach we have taken to secure a long-term future for the Michelin Dundee site. "The Scottish Government will continue to do everything we can to support the repurposing of the Michelin Dundee site as an Innovation Parc, as it becomes a key location for low carbon energy and low carbon transport development in Scotland." The royal couple officially opened the V&A Dundee museum earlier on Tuesday. They marked the opening by unveiling a carved wooden panel which will be displayed in the entrance foyer. William and Kate met its architect Kengo Kuma, local designers, schoolchildren and young people who have worked with the venue. The pair also toured the £80m museum's permanent Scottish Design Galleries, and visited Charles Rennie Mackintosh's Oak Room, which was originally opened in Glasgow in 1908.